A guide to projects around the home that will inspire you this spring. A sure way to increase the value of your home and increase energy efficiency is to replace your old, worn windows with high-quality windows. Guaranteed no hassle with The Window Place Plus Exteriors. This was not your run-of-the-mill project with an expansive space, this was a labor of love. Nothing about this kitchen was a simple refinishing; everything that was done was custom made by the team and has not been created before. Now that it’s done, it can truly be seen as one of the best show kitchens and entertainment spaces they have done to date. There’s nothing like a beautiful paver patio for outdoor entertaining. The options for types of pavers are endless, which means there are countless ideas for custom designs that will fit with any landscape and any budget. The incorporation of natural stone along with large slab-style pavers creates an inviting environment which complements the woodland setting. Landscape selections offer colors and textures that are focused on the late spring to early fall. Replacing worn roofing is a quick project that will last for years and make your home more energy efficient. There are so many options to choose from to help create a designer look. Instead of replacing cabinets or getting rid of your favorite piece of furniture, keep up with the latest trends with the cost-effective approach of refacing and refinishing. Custom Renovations will help keep your home updated and upgraded quickly and without sacrificing quality. Outdoor fireplaces are a true asset to a home’s landscape. Not only do they provide warmth on cool spring evenings, they add elegance and a welcoming feeling to any outdoor living space. Water features add a uniqueness to any outdoor living space and are sure to impress guests. They are visually appealing and offer a sense of tranquility that enhances any landscape. Custom built-ins and trimwork can absolutely transform a room. This luxury home office is second to none with magnificent custom book shelves and top-of-the-line trimwork that places the entire room in a class of its own. Ahh, what’s better than having a beautiful pool to relax in after a long day at work? This gunite pool is a true beauty. Gunite pools are popular for the versatility of custom shapes and sizes, as well as for their durability. The kitchen is where everyone gathers and here is one that’s up to par on luxury and elegance. This dream kitchen meets all the requirements of custom design, beauty and functionality. MATTEO FAMILY KITCHENS & FLOORING, INC.
A simple change in flooring can breathe new life into a room. From hardwood to luxury vinyl tile to carpet, there are many options available to fit your needs and your budget. 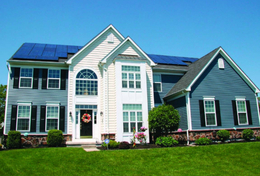 Adding a residential solar program may help to eliminate your electric bill completely, requiring $0 out of pocket. This fully funded, no-risk, no-investment program can be yours with the support of state and federal funding sources. 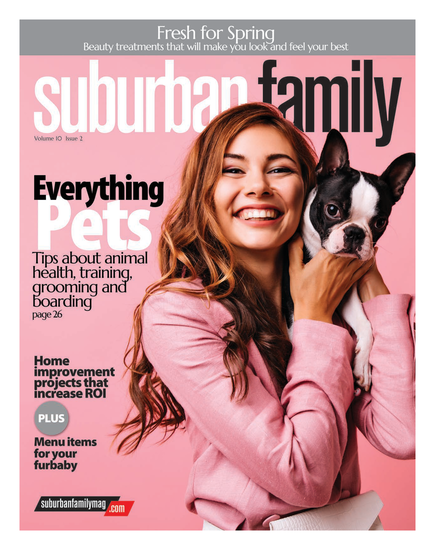 Published (and copyrighted) in Suburban Family Magazine, Volume 10, Issue 1 (March 2019).